At Tec-age, a Copy Graphics technology company, IT is more than just a solution. It's a relationship. We are here to provide you with quality business solutions and ongoing support. We can handle anything from small computer issues to complete network implementations. Let us streamline your business operations and communication with a professionally designed, dependable network that improves your work efficiency. 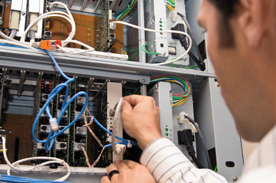 Tec-age Computer Solutions serves as your company’s IT department when having an on-site IT staff is cost prohibitive. We will work with your existing vendors and build a relationship with them so that you can do what you do best. Prepaid “block hour” rates available at a discount price. No additional charges for labor or mileage. Service and support when you need it via phone or on-site. Use time for computer diagnosis and repair, network support, software support, installation of new equipment or data transfer. We offer Valley-Wide IT and Computer Networking service.